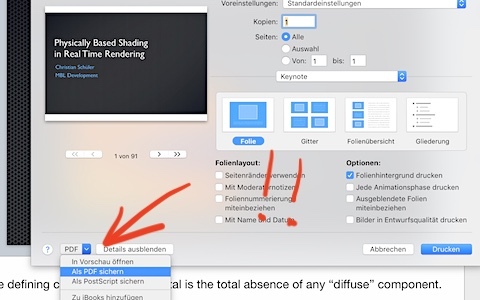 The slides of my 2013 talk at FMX in Stuttgart were avail­able for down­load for a long time now in both Keynote and Pow­er­point for­mats. How­ev­er, peo­ple keep ask­ing for a PDF ver­sion. As I wrote in the com­ments once, I always had bad luck with the PDF export from Keynote, so I left it at that. Yes­ter­day I made a major dis­cov­ery: The option “export to PDF” is not the only pos­si­bil­i­ty, in fact, it is quite an infe­ri­or one. The thing that I over­looked is that one can also just pre­tend to “print”, and then, in the sub­se­quent print­er dia­log, chose “save to PDF” instead. Not only does this give addi­tion­al options but also pro­duces nicer for­mat­ting and a small­er file! I won­der how­ev­er the UI design­ers at Apple real­ly intend­ed this to be the pri­ma­ry means of PDF export? Any­way, I updat­ed the slides to PDF for­mat and also made some minor cor­rec­tions. I exchanged the font Human­ist 521 with Gill Sans. Appar­ent­ly the for­mer is an offi­cial clone of the lat­ter, and since Gill Sans is pre­in­stalled on a Mac any­way, I may as well just use the orig­i­nal. The met­rics also seem to look nicer in the PDF. I also copy-edit­ed some of the notes to be more edu­ca­tion­al than just a tran­script of my talk. Here is again, the direct down­load link. This entry was posted in Uncategorized and tagged download, physically based shading by christian. Bookmark the permalink.